Hello again! In another attempt to cover events that built up while I was away, here are some stories that took place back in March and early April of this year, and which may prove to be some of the greatest scientific finds of the year. In fact, they may prove to be some of the greatest scientific finds in recent history, as they may help to answer the most fundamental questions of all – namely, what is the universe made of, and how did it come to exist? First up, in a development that can only be described as cosmic in nature (pun intended), back in March, astrophysicists at the Harvard-Smithsonian Center announced the first-ever observation of gravitational waves. 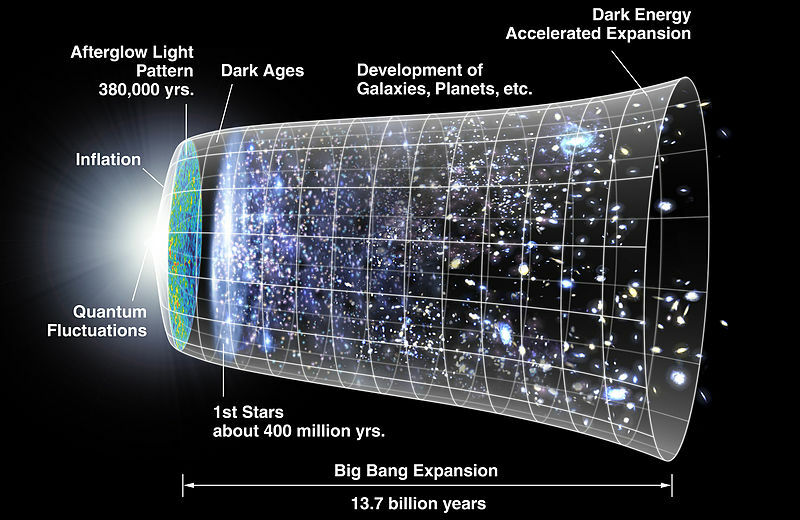 This discovery, which is the first direct evidence of the Big Bang, is comparable to significance to CERN’s confirmation of the Higgs boson in 2012. And there is already talk about a Nobel Prize for the Harvard crew because of their discovery. This theory, which states that the entire universe sprung into existence from a tiny spot in the universe some 13.8 billion years ago, has remained the scientific consensus for almost a century. But until now, scientists have had little beyond theory and observations to back it up. As the name would suggest, gravitational waves are basically ripples in spacetime that have been propagating outward from the center of the universe ever since the Big Bang took place. Originally predicted as part of Einstein’s General Theory of Relativity in 1916, these waves are believed to have existed since a trillionth of a trillionth of a trillionth of a second after the Big Bang took place, and have been propagating outward for roughly 14 billion years. The theory also predicts that, if we can detect some gravitational waves, it’s proof of the initial expansion during the Big Bang and the continued inflation that has been taking place ever since. 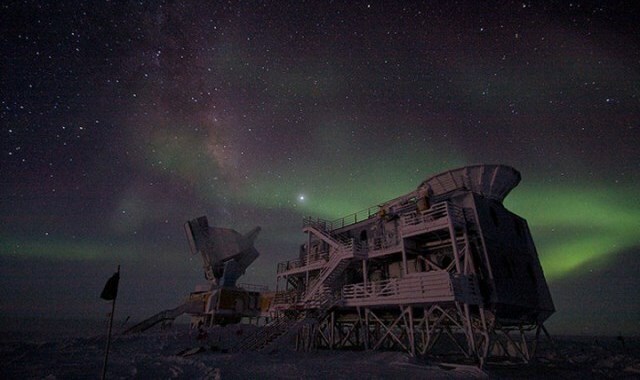 Between 2010 and 2012, the BICEP2 – a radio telescope situated at the Amundsen–Scott South Pole Station (pictured above) – the research team listened to the Cosmic Microwave Background (CMB). They were looking for hints of B-mode polarization, a twist in the CMB that could only have been caused by the ripples of gravitational waves. Following a lot of data analysis, the leaders announced that they found that B-mode polarization. The work will now be scrutinized by the rest of the scientific community, of course, but the general consensus seems confident that it will stand up. In terms of scientific significance, the confirmation of gravitational waves would be the first direct evidence that the universe started out as nothing, erupted into existence 13.8 billion years ago, and has continued to expand ever since. This would confirm that cosmic inflation really exists and that the entire structure of the universe was decided in the beginning by the tiniest flux of gravitational waves. These scientists found that by removing all known sources of gamma rays, they were left with gamma-ray emissions that so far they cannot explain. And while they were cautious that more observations will be needed to characterize these emissions, this is the first time that potential evidence has been found that may confirm that this mysterious, invisible mass that accounts for roughly 26.8% of the universe actually exists. To be fair, scientists aren’t even sure what dark matter is made of. In fact, it’s very existence is inferred from gravitational effects on visible matter and gravitational lensing of background radiation. Originally, it was hypothesized to account for the discrepancies that were observed between the calculations of the mass of galaxies, clusters and entire universe made through dynamical and general relativistic means, and the mass of the visible “luminous” matter. The most widely accepted explanation for these phenomena is that dark matter exists and that it is most probably composed of Weakly Interacting Massive Particles (WIMPs) that interact only through gravity and the weak force. 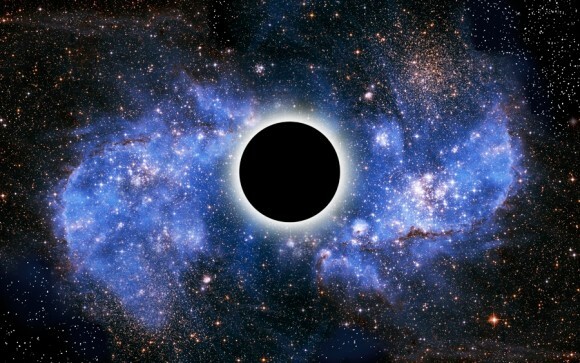 If this is true, then dark matter could produce gamma rays in ranges that Fermi could detect. Also, the location of the radiation at the galaxy’s center is an interesting spot, since scientists believe that’s where dark matter would lurk since the insofar invisible substance would be the base of normal structures like galaxies. The galactic center teems with gamma-ray sources, from interacting binary systems and isolated pulsars to supernova remnants and particles colliding with interstellar gas. It’s also where astronomers expect to find the galaxy’s highest density of dark matter, which only affects normal matter and radiation through its gravity. Large amounts of dark matter attract normal matter, forming a foundation upon which visible structures, like galaxies, are built. The new maps allow us to analyze the excess and test whether more conventional explanations, such as the presence of undiscovered pulsars or cosmic-ray collisions on gas clouds, can account for it. The signal we find cannot be explained by currently proposed alternatives and is in close agreement with the predictions of very simple dark matter models. Hooper and his colleagues suggest that if WIMPs were destroying each other, this would be “a remarkable fit” for a dark matter signal. They again caution, though, that there could be other explanations for the phenomenon. 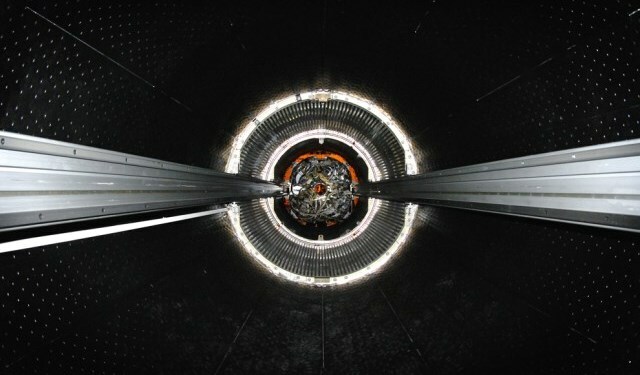 Writing in a paper submitted to the journal Physical Review D, the researchers say that these features are difficult to reconcile with other explanations proposed so far, although they note that plausible alternatives not requiring dark matter may yet materialize. Dark matter in this mass range can be probed by direct detection and by the Large Hadron Collider (LHC), so if this is dark matter, we’re already learning about its interactions from the lack of detection so far.This is a very exciting signal, and while the case is not yet closed, in the future we might well look back and say this was where we saw dark matter annihilation for the first time. Still, they caution that it will take multiple sightings – in other astronomical objects, the LHC, or direct-detection experiments being conducted around the world – to validate their dark matter interpretation. Even so, this is the first time that scientists have had anything, even tentative, to base the existence of Dark Matter’s on. Much like until very recently with the Big Bang Theory, it has remained a process of elimination – getting rid of explanations that do not work rather than proving one that does. So for those hoping that 2014 will be the year that the existence of Dark Matter is finally proven – similar to how 2012 was the year the Higgs Boson was discovered or 2013 was the year the Amplituhedron was found – there are plenty of reasons to hope. And in the meantime, check out this video of a gamma-ray map of the galactic center, courtesy of NASA’s Goddard Space Center.